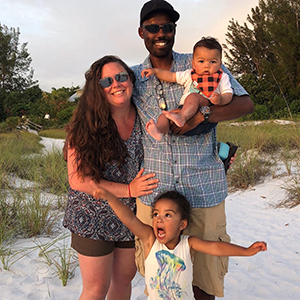 When their son Nate was born in October 2017, parents Natalie Wallace and Luther Cuffy of San Francisco didn’t hesitate to donate their baby’s umbilical cord blood to a public cord blood bank at Kaiser Permanente San Francisco Medical Center. Wallace, whose roots are European, and Luther, an African-American, understood the importance of diversifying the blood bank with the Cleveland Cord Blood Center, increasing the potential for a donor match for someone of similar ancestry. Cord blood donated at Kaiser Permanente San Francisco is shipped to the Cleveland Cord Blood Center, which collects, processes, stores and distributes stem-cell rich umbilical cord blood for research or transplantation in patients with life-threatening disorders such as leukemia, lymphoma and immune system disorders. “It’s exciting to think of the benefits that cord blood offers. We are happy we can provide it If we can help someone who is going through blood cancer,” said Wallace, a registered nurse. During her pregnancy, she had been offered information about the process and signed up without hesitation. The opportunity to donate her first baby’s cord blood to a public cord blood bank wasn’t readily available at the time of her daughter, Skylar’s birth in 2015. “Cord blood is precious…it’s like gold, and has so much potential to help so many,” she added.